Queen’s Gurkha Engineers and The Band of the Brigade of Gurkhas became the runners up at the Army Inter Major and Minor Units’ Championship 2016 which was held in Aldershot Garrison Sports Club on 17 March 2016. The Band of the Brigade of Gurkhas entered the minor units final beating 4 RMP while 36 Engineer Regiment, Queen’s Gurkha Engineers beat 6 REME to reach the Army Major Units final. Both the BG units performed extremely well to reach the finals. 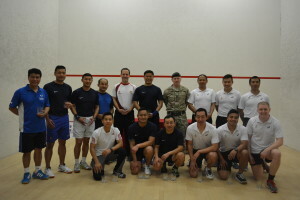 The Band of the Brigade of Gurkhas lost the finals against a strong “Upavon Station” team led by Maj Gen T R Urch CBE, President of the Combined Services Squash Rackets Association. Likewise, 36 Engineer Regt QGE became the Army Major Unit runners up. They lost their final match played against another strong team, 1 RSME. The President of the Combined Services Squash Rackets Association, Maj Gen Urch CBE gave the final speech at the award ceremony afterwards and thanked everyone for playing a superb series.